Crabtree Barn has a history stretching back at least to the 1500s where records show evidence of a public house being on the site known as Glen Hey. Due to its remote location it was almost certainly a pub which served the workers at the two nearby mills, Upper Firth House Mills (located at the bottom of Hey Lane and now half a dozen houses) and Thollin Wood Mill (which was behind the pub down the footpath and by the stream). In 1855 the pub was rebuilt and the Shoulder of Mutton reopened. Above the barn arch a plinth was places with the letters ‘J & M C 1855’ upon it. It is not certain to whom the letters referred, but they could have been either John and Martha Crabtree, who lived at Glen Hey next door, as they probably financed the building of the new inn, or John and Matilda Crabtree – John being the couple’s son. Either way it was John and Matilda Crabtree who relocated from Jericho (which still stands on Berry Mill Lane) and ran the Shoulder of Mutton. John ran a brewery from the inn and Matilda ran the public house. John died within a few years of the public house being opened, but Matilda continued to run the inn with help from her children as well as farming a large expanse of land, rented from the Broadbent family. In total she lived at the inn for thirty years, still the longest residence at the property to this day. The barn would certainly have been used for storing hay as well as animals and the large beam across the kitchen diner is the original ‘Queen’s truss’ that was used in the building’s construction. It must undoubtedly have been tough living in the Blackburne Valley in the 19th century and Matilda’s reputation as a formidable woman has run through the ages to this very day. In the 1970s a very old lady came to visit the area and recalled the house as an inn when she was a small girl in the 1880s. She recalled looking up the stairs at what to her was the oldest woman she had ever seen, who was sitting quietly in a rocking chair smoking her pipe! Matilda Crabtree certainly smoked a pipe and for years after her death locals in the bar would occasionally get a whiff of the brand of tobacco she used to smoke and admit that it was just Matilda coming back to check on them all. Matilda Crabtree was buried in the nearby Dean Head church in Scammonden. A number of other inn keepers kept the Shoulder of Mutton, but when Thollin Wood Mill shut after a dispute over water rights then there was no real trade to keep the pub going. In the mid 1920s the inn was converted to housing. The barn was generally used for storage and keeping animals such as chickens for generations until the 1990s when the Mason family bought the property and renovated the barn, installing the first floor and using the area as a studio, constructed the atrium so that the first floor did not clash with the level of the arch and knocked through doorways into the house. 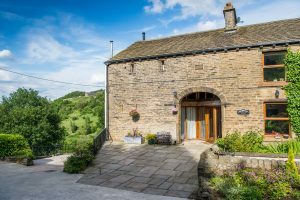 In 2002 Rachel and Wayne bought the property, converting it in 2013 into a holiday let with a kitchen diner and two bedrooms with en-suites, as it is today and blocking off again the house from the barn. We named the barn Crabtree Barn after the Crabtrees who ran the pub originally in Victorian times.